In re-reading my past few posts, I have been a bit critical of Geneva and on a grander scale, the whole of the Northern Hemisphere. Geneva is not a bad place, it just takes some getting used to. There are some things about Geneva that I do like. The first, as I've mentioned is being able to walk everywhere and utilize the fantastic and reliable bus system. Second, there is a beautiful park right near where we live and I love going there to run, walk or work out. Granted soon this park will be covered in ice but for now, I love it. Third, Geneva is brimming with stunning bread, pastry and sweet shops. Boulangerie (bakery), patisserie (pastry) and confiserie (confectionery), these are the only French words that I need to know. As a person who tries to eat carefully at first I enjoyed these shops only because they are so visually pleasing. I would visit them but would only order coffee and would admire the beautiful displays from afar. But then, on my birthday, I ate a chocolate eclair and since then the floodgates have opened and now I'm a raging out of control pastry eater and guess what, I don't even care. If I've found something about Geneva that I enjoy I figure I need to embrace it. The eclair that started it all. Recently, I decided to make a day of pastry eating. I thought it would be a delicious endeavor and would make for a good blog post. My thought was that I'd walk around the city visiting multiple establishments and enjoy a sweet treat at each one. I could visit about five or six of these lovely shops within close walking distance to where we live, but I thought if I could combine a fair amount of walking into the agenda, I might burn a few calories while at the same time consuming thousands of empty ones. To begin my pastry eating marathon, I walked down by the lake, but strangely I found myself in an area of town that seemed to have no bakeries/pastry shops. I walked, walked and walked finally becoming so hungry that I contemplated scrapping the whole idea and just eating pizza, as I did pass numerous pizza shops. Eventually I found a place called Globus. Globus is a department store which contains a big food hall filled with all kinds of edibles. 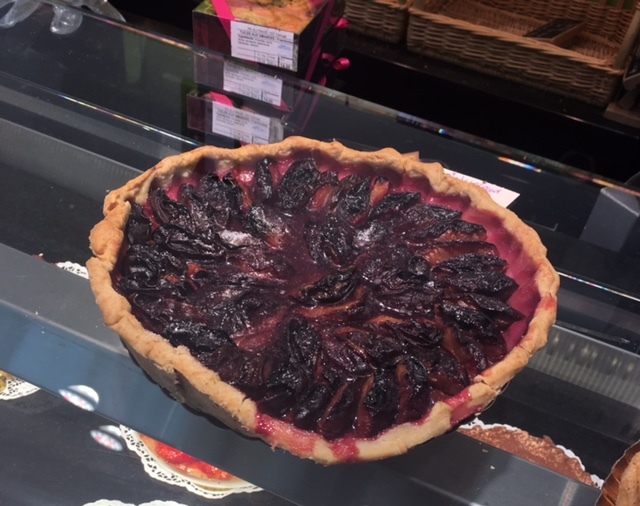 I found a pastry counter and ordered the most beautiful, glistening plum tart I've ever laid eyes on. After enjoying my treat, I was so full that I couldn't continue my plan of pastry crawling so I decided to take a new direction and spread my pastry eating out over a longer time period to ensure maximum enjoyment. One Sunday, I asked Mr. Deep if he would like to join me in my pastry eating quest. He agreed and so we walked to a nearby shop. The case was full of gorgeous pastries, chocolates, breads and sandwiches. Mr. Deep then decided he wanted to order a ham sandwich instead of a pastry. Seriously?! But while he ate a proper lunch, I enjoyed some kind of almond flavored crispy horn filled with a caramel custard that was to die for. Clearly Mr. Deep missed the point of the exercise. I'm looking forward to continuing to eat my way around the city. Oh my goodness Liza. They all look so scrumptious, so sadi can't join you! Hugs. Thanks Avril! Yes, very tasty. Miss you!